SO HEY! Meet your new favorite late-summer salad! It’s packed with peaches, basil and crispy prosciutto… and BURRATA. I think I’ve said this before, but when I do salads, I do them up, big and hearty. Nothing wimpy, unless they’re meant for snacking or as a side, and even then, I still load them up with all the good things. SO, pretty sure I never mentioned this, but last week I made a little goal for myself. The goal was to use up everything I had in the fridge and or freezer before I went to the grocery store. Like everything. You see, my town has been PACKED with people all summer long and getting around is just not fun. You’re better off walking or riding your bike. Of course that’s kind of hard to do when you have loads of groceries. So because of this, coupled with the fact that my personal shopper…aka my dad (for real, he’s the best), was out-of-town, I decided that the grocery store was just not on my list of places I wanted to go. Surprisingly, I stuck with my goal all week-long… with the exception of quickly running down to my local farm stand for fresh heirloom tomatoes and peaches mid-week. Don’t judge, I NEEDED those tomatoes and peaches. I mean, it’s summer and I just could not deprive myself. Tell me you get it. Anyway, all of my upcoming blog posts were made with the contents of my fridge from last week, and oddly I am so excited about each and every recipe. Granted, my fridge was pretty well stock before I came up with this little goal, so really, it wasn’t THAT hard, and I enjoyed having fun with the ingredients I had on hand. 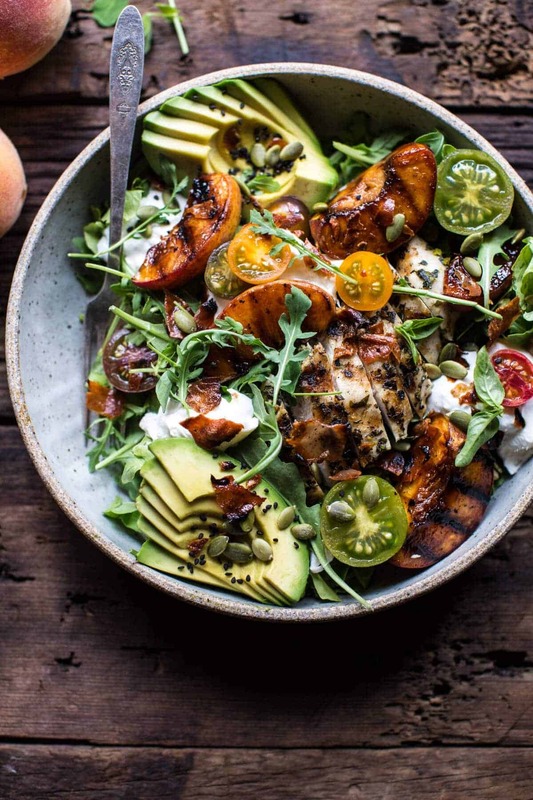 In an effort not to turn the oven on, this entire salad is made on the grill and ready for eating in about thirty minutes. It’s full of protein, greens, and fruit, and is great both warm or cold (although, I prefer it warm!). Can you say, YESS. In all seriousness though, this salad is pretty awesome. 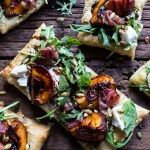 I LOVE the combo of peaches, balsamic and prosciutto…especially crispy prosciutto… SOO good. 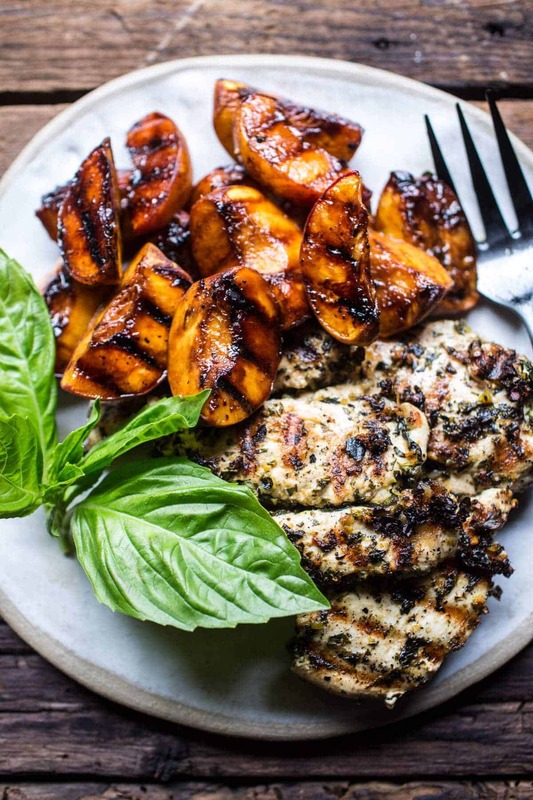 And um, that grilled basil chicken?!? Summer chicken perfection right there!! OK, and if you’re just not in a grilling mood, and you don’t care about having to turn your oven on, you can totally roast both the peaches, chicken and prosciutto all together on ONE baking sheet and call it a day. I’d say about twenty to twenty-five minutes at four hundred degrees F. for the chicken and peaches, then add the prosciutto during the last five minutes of cooking. 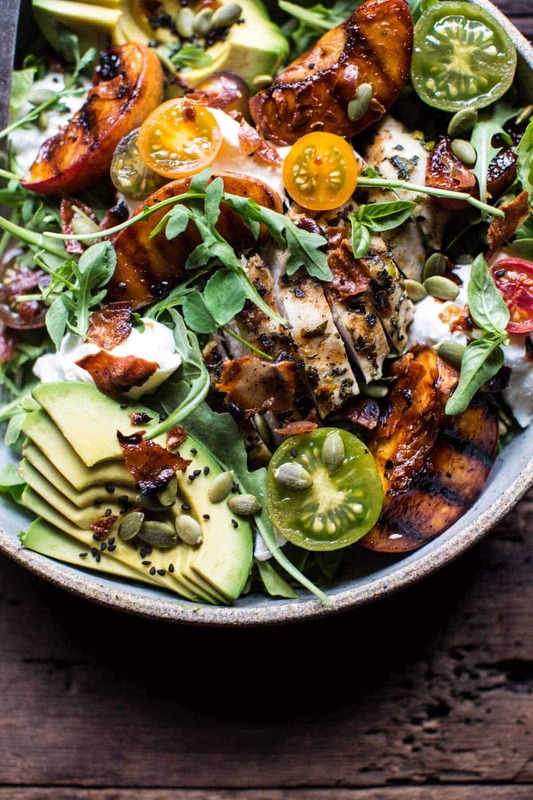 Easy peasy and a great option to transition this meal into fall come mid September. Add the peaches to a bowl and toss with the balsamic vinegar and honey. Add the chicken to a separate bowl and toss with the olive oil, basil, oregano, salt + pepper. Preheat your grill, grill pan or cast iron skillet to medium high and brush the grates with oil. Remove the peaches from the balsamic mix and grill the for 2-3 minutes or until light char marks appear, flip and grill another 2-3 minutes. Remove from the grill. Reserve any remaining balsamic mix for the vinaigrette. To the grill, add the chicken and and prosciutto to grill for 5-8 minutes per side or until the chicken is cooked through and the prosciutto crisp. Remove from the grill and let rest 5-10 minutes. Thinly slice the chicken and crumble the prosciutto. In a large salad bowl, combine the arugula, tomatoes and gorgonzola. 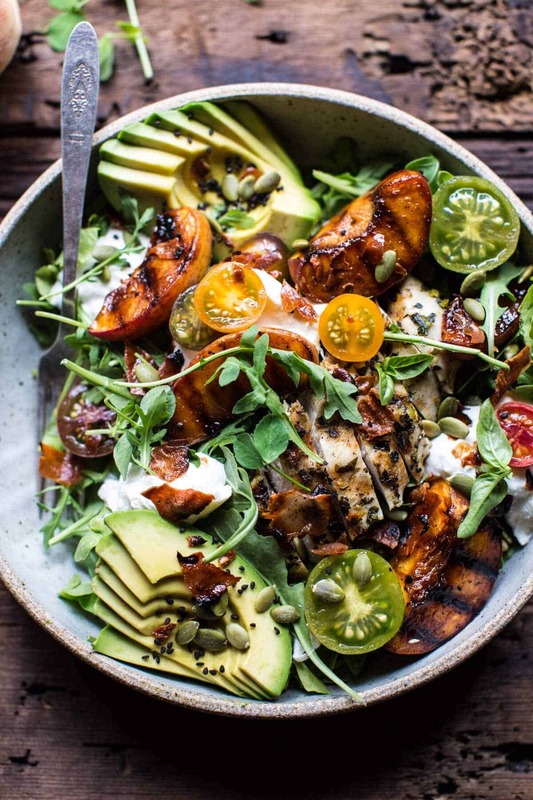 Top the salad with grilled peaches, chicken, burrata or mozzarella, and sliced avocado. Sprinkle the toasted seeds all over the salad. Serve the salad alongside the balsamic vinaigrette (below). Grab any remaining balsamic mix from when you tossed it with the peaches. To that, add the olive oil, 1/4 cup balsamic vinegar, basil, mustard, salt and pepper. Taste, and adjust seasonings to your liking. Serve alongside the salad. 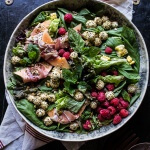 Fresh Basil Salad with Prosciutto Wrapped Melon and Toasted Seed Rolled Goat Cheese. This looks really yummy. Can’t wait to make this for my wife and me. But there is a tease. You talk about crispy prosciutto, but it’s not on list of ingredients or in the instructions. I think that will add a wonderful touch, so…help! Hey Ed! I am fixing the recipe to add the prosciutto now!! Thanks for letting me know! I hope you and your wife enjoy this. ? Loving all these peaches lately! Second, we were writing the shopping list (well, I was writing the shopping list to my fiance :p) based on your ingredients list above, and then realised that the prosciutto isn’t in the list… I can totally see where it fits and how to add it in, but as I normally write the shopping list just based on your ingredients list we very nearly forgot it! Hi Cam!! I totally forgot to add it in, but I am adding it right now as we speak! Thanks so much for letting me know and I hope you enjoy this!! ? prosciutto and peaches is probably one of my favorite things in the world. Balsamic? Yes! Grilled Peaches? Absolutely! Grilled Chicken? Now you’re talking! Crispy Prosciutto? I’m in heaven!! I would be happy to have this salad every day for a year! And I will go vote for you 🙂 Have a great day. Woohoo! I am so happy this is so perfect for you, Marisa!! And thank you so so much for voting! ? Ok remember I’m the lazy voter–2 votes now–lol. Haha! Thanks for voting Nancy! And thank you I hope you enjoy! This bowlful overload of awesomeness makes me soooo hungry!!!! Put that in front of me with a tall glass of peach tea….I’m done. ? Awesome!! I hope you enjoy them Sheila! Congratulations on your nominations! That’s amazing, and well-deserved. 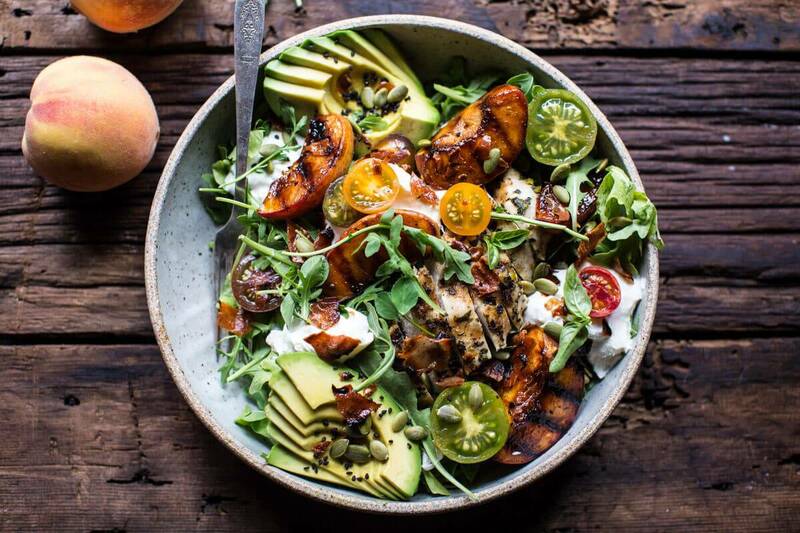 This salad also looks delicious, peaches are so perfect right now! Thanks so much Christine!! 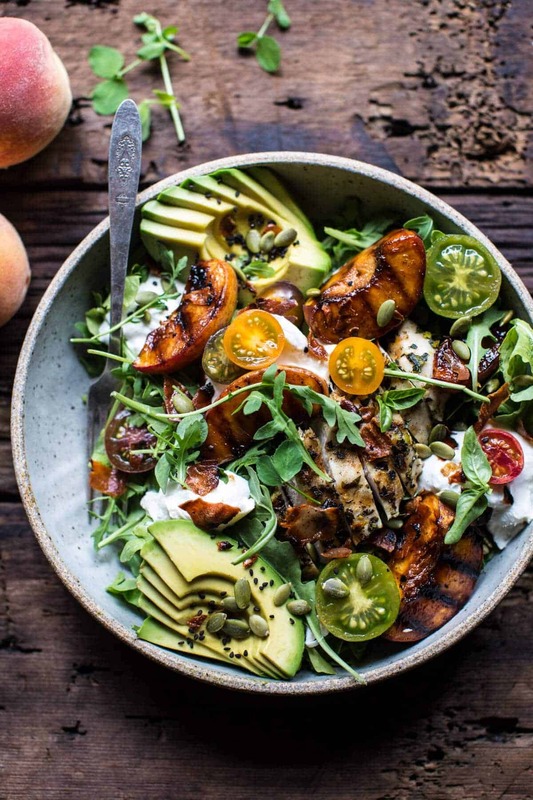 I hope you enjoy this salad, I am obsessing over peaches right now!! 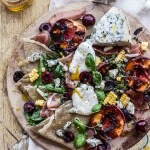 Peaches PLUS salty crispy prosciutto?! sounds like the best salad toppings EVER! YES!! So happy you like these! Thanks Amanda! I LOVE the crispy prosciutto on this one! Looks amazing! And the prosciutto? Please add the directions for it. Yes, I just added the directions a few minutes ago!! I hope you enjoy this! Thanks Marion! Awh! So sorry about that Lea! I just put up how to make the prosciutto because I TOTALLY forgot! ? I am so happy you enjoyed this though, and hopefully make it again! Thanks! ? Just made this! Since it was pouring rain, I cooked peaches and chicken in my cast iron skillet. Delicious!! That sounds amazing!! I am so happy you loved this! Thanks Linda! This is so my new favorite salad! 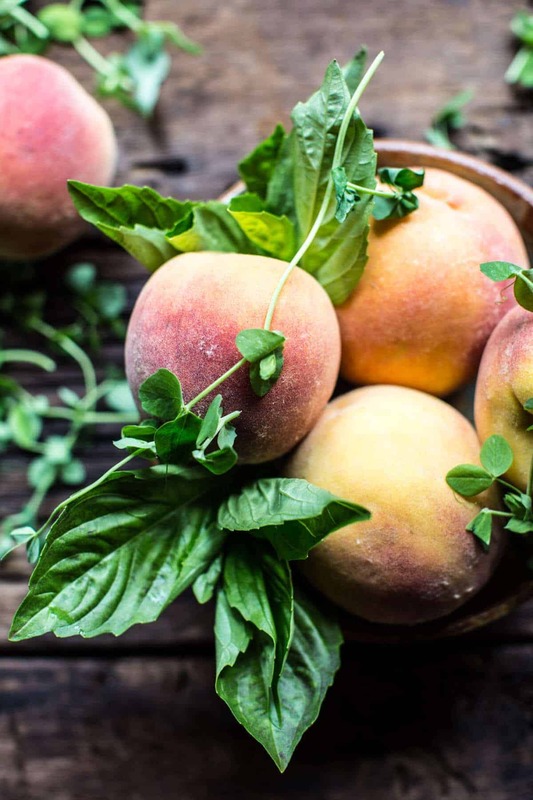 Totally obsessed with those balsamic peaches, and the prosciutto + basil is a total win! This recipe looks amazing! However, unfortunately we do not have a grill. Do you have any recommendations on how to cook the ingredients that require a grill? Hey Lindsey! 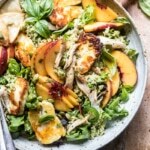 You can roast both the peaches, chicken and prosciutto all together on ONE baking sheet and call it a day. I’d say about twenty to twenty-five minutes at four hundred degrees F. for the chicken and peaches, then add the prosciutto during the last five minutes of cooking. Let me know if you have questions. Thanks! Yes. To all of it. Wowzer. Will probably make this soon! Thank you!! Hope its amazing!! I love to hear that!! I am so happy you and your family enjoyed this! Thanks so much Linda! My husband and I really really enjoyed this! Thanks so much for being a great resource. I’ve loved all your recipes I’ve made 🙂 quick q on styling the food… Mine looked sorta flat when I was done. Do you have any tricks you recommend when playing something like this? Hey Ashley!! So, i will not lie, it takes me a while to style food, so don’t feel bad that your salad didn’t look exactly like mine. When building salads, I like to kind of like to build them up from the center and then evenly distribute the colors. If you have specific questions, let me know, happy to help! Thank you so much!! 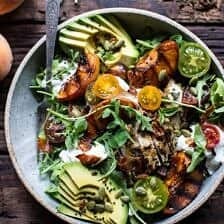 This salad was a delicious way to use up all of our fresh CSA veggies! It was perfect. I just love you blog. Keep the tasty creations coming. Thanks for adding this to your Sunday recipe line-up! I’m making this salad for a party in mid June! I can’t wait! Ooo that is so amazing! I hope you and your guests love it, Cassandra! Thank you! I made a modified version of this tonight and it was amazing! I used feta instead of gorgonzola, and left out the burrata and the prosciutto to save money. However, it was still delicious so I imagine following the original recipe would be even better. The fresh basil in the dressing was such a nice surprise. Ooo! That sounds amazing! Thanks so much for trying it Hilary! Awh wow!! SO happy you like it so much Sam!! Its so cool that your blogging and i’m honored to be your inspiration!! The blog looks amazing!! Holy moly! This is a fabulous recipe! I received a box of beautiful Georgia peaches and wanted to use them in an entree recipe. I left out the buratta because I am lactose-sensitive, and the sunflower seeds because frankly I just forgot them. Wouldn’t change a thing! My family loved this as supper on a 100+ degree day. It would be an amazing choice for a luncheon. I am so happy to hear that! Thank you so much Meghan! This salad was amazing! I made it for dinner on a family vacation to Palisade, CO where we got fresh peaches! Everyone loved it! I did substitute goat cheese crumbles for Gorgonzola. Thank you so much Amanda! I am so glad you loved this salad and I am sure the freshly picked peaches were amazing! Absolutely delicious. Followed the recipe exactly, except plated each salad individually. Not only was it terrific, it looked beautiful plated with peaches, cheese, fresh oregano sprig and all the other yummy ingredients. Guests were impressed and everyone loved it. Thank you. I am so happy to hear that! Thank you Michelle! This was absolutely delicious. So manny yummy flavors. If I owned a restaurant this would be on the menu!